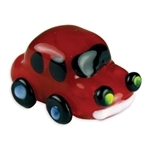 Transportation - Looking Glass Online Shop - Highly detailed collectible hand-crafted glass sculptures of everything from Doggies to Dragons, Animals, bugs, Birds, Ocean Creatures and more! Jerome the SchoolBus is a big, sturdy vehicle that carries children to and from school every day. Jerome plays an important role in children’s lives. He was the inspiration behind the song, “The Wheels on the Bus”. Jerome is painted the official, school bus yellow so that he is noticeable to other drivers on the road. He was built on July 26, 2011. RedCar the AutoMobile is a quick little vehicle. He is able to go from zero to sixty in six seconds! His red color makes him an easy target for speeding tickets, so he must be driven responsibly to stay out of trouble. RedCar is perfect for road trips and joy rides. He looks best when washed and waxed often. He was built on August 30, 2011. 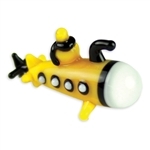 Snorko the Submarine is an underwater explorer. Despite his bright color, he is very stealthy and passes by boats undetected. When he wants to take a look around above water, he moves close to the surface and takes in the surroundings through his periscope. Snorko is run with nuclear energy and can travel great distances. He was built on September 22, 2011. Tooter the Scooter is a fun little motorcycle that’s perfect for city living. 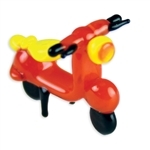 His small frame allows him to be parked in tight spaces, a great feature for urban areas. 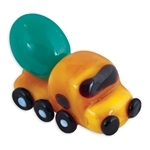 Tooter has small wheels which means he’s not very fast but his floorboard makes him a comfortable ride. His rider needs to wear a helmet and some protective riding gear. Tooter was built on October 14, 2011. 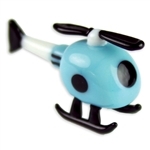 Whirly the HeliCopter is a lightweight rotorcraft with one set of propellers on her roof. Whirly is able to perform certain tasks that other aircraft cannot, such as vertical takeoffs and landings. She can also fly backwards, laterally, and hover. Whirly can carry heavy loads connected to a dangling cable and she can also land on rooftops. She was built on October 27, 2011. Zoom the MotorCycle is speedy and perfect for a quick escape. He is often the envy of all the other vehicles on the road as he easily slips through heavy traffic. Zoom is small but he is nearly as loud as a semi truck. He has a soft seat and a windshield to protect his rider from a mouthful of bugs. Zoom was built on November 29, 2011. KickFlip the SkateBoard is sporty and fun. 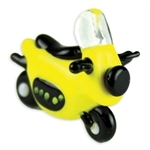 He has four slick wheels and loves to make extreme jumps. Riding him requires balance and protective gear. KickFlip has an assortment of radical tricks on his list of abilities. 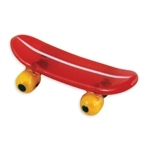 His carefree attitude attracts people with a similar mentality to hop on and glide down the street. KickFlip was designed on May 29, 2011. Charley the CementTruck has a dirty, yet very important profession. He has the responsibility of helping people pave flat roads and foundations. Every day, Charley drives to new sites and pours out high quality cement. He is reliable and has a large role in the home construction industry. Charley the CementTruck was manufactured on June 13, 2011. ChooChoo the Train is built to travel long distances on the railroad. He likes to blast his horn to announce his presence as he makes his way through town after town. 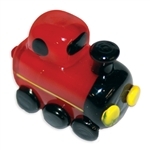 ChooChoo can carry lots of passengers. 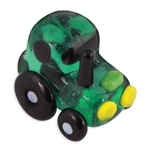 A ride on ChooChoo is a smooth and glamorous way to travel. The scenery he passes on his way across the country can be breathtaking! He was built on June 30, 2011. JD the Tractor is a tough construction vehicle with a mission to move heavy dirt. JD has big tires that allow him to climb up steep hills and rough terrain. His best feature however is his heavy duty shovel in the front that is capable of picking up tons of material and moving it from one location to another. JD the Tractor was built on July 30, 2011.